In the March/April 1999 issue of Decoy Magazine, Barney Crandell made a significant claim to fame for Peter M. Pringle when he categorized him as the "originator of the Dunnville style." At first sight this title may suggest hyperbole in view of Pringle’s relative anonymity until recently, but evidence continues to mount supporting the appropriateness of the Crandell designation. One may point to Cecil Anger, Myrl Smith or the more than 20 local carvers currently practicing the decoy art in Dunnville, Ontario as clearly exhibiting the influence of the town’s better known son, Ken Anger. But one should bear in mind that this kind, modest man, who welcomed many apprentices to his workshop at 44 Main Street West, learned much of his trade from imitating the example of Peter Pringle. Before encountering Pringle’s high-profile birds, Anger produced his so-called "pancake models." As the name suggests, they were particularly wide and flat, presented a low silhouette, and did not share the success reputedly enjoyed by Pringle’s rig. Pringle only made about 75, mostly solid, three-dimensional decoys for his final rig between 1929 and 1944 and jealously guarded his techniques and patterns with an eye to potential copyright. Nevertheless, despite his increasing isolation through progressive deafness, he chose to convey knowledge of his art to two younger friends and students, Harry Freestone and Merle Franklin. While working at this branch in the fall of 1938, Harry Freestone happened to pass by the window of the Canadian National Railway office at the corner of King and Yonge. Every year the railway offered an exhibit of Pringle’s decoys to promote hunting excursions by train. He immediately fell in love with Pete’s work. An avid hunter himself, he just had to discover the identity of the man who had created such masterpieces, especially a mallard drake that caught his eye. His persistence paid off with an introduction, and the two soon discovered they had another interest in common, the collecting of Indian artifacts. Harry had begun to accumulate them as a boy of ten, a parallel to Pringle’s youth in Dunnville. Harry, 33 when they met, would drive the older Pringle (60 years) to Dunnville on the weekends to pursue their two passions. Because decoys initially attracted Freestone to Pringle, they continued to play a major role throughout the relationship. Before Harry left for overseas during the war, Pringle, contrary to his usual practice, and as a mark of fondness for the younger man, lent him his patterns and offered to assist in the making of a rig. Harry took advantage of this rare opportunity, managing to carve 16 birds. Only eight were completely painted, three bluebills (two with half-closed eyes, a Pringle feature) and five mallard drakes. Pringle’s second student, Edward Merle Franklin, was born on April 25, 1915 in Dunnville, where he obtained an education in the local schools and spent most of his life. He worked in a fishnet factory, as a foreman in an automotive wire assemble plant and retired as a custodian with the local school board. In the summer of 1939 Franklin and Pringle met at an archaeological excavation at a farm south of Dunnville. William Wintemberg of the National Museum of Canada conducted the excavation, primarily instigated through the persistent efforts of Pringle, the local authority. Pringle noted a marked decline in surface finds on weekend visits to his favorite site. He inquired among the neighborhood farmers to find out what was happening during his absence and learned that a local boy, Merle Franklin, was getting to the best spots more quickly during the week. In a November 1940 letter to Franklin, Pringle wrote: "The Shore Site at Klinganders (a farm) has been booked as my ‘OLD STANDBY,’ the best, most productive one place or site along the whole Grand River shore in vicinity of Dunnville (OUR FIELD). I could always bank on finding something there, at other places NO! (I mean I could until you entered the picture – understand I am glad you did)." The two men quickly became friends, sharing, to quote Merle, "mutual interests in duck hunting and archaeology." From the outset Merle preferred traditional tools to mechanical aids and has accumulated a wide range of chisels, gouges, files, rasps and draws knives. The one exception is a bandsaw, his "biggest time saver." Like Pringle, he frequently uses cedar for the bodies and willow for the heads. He’s also used basswood for heads and butternut for decoratives. Although the majority of Merle’s decoys are solid, he has made some hollow birds with the aid of a forstner drill bit. 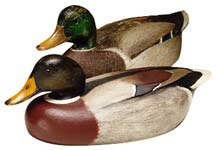 According to his records, Merle made 2255 items from 1987 to 1999: ducks, geese, doves, game birds, robins, fish and a blue heron, but above all, miniature duck plaques, primarily from pine. He borrowed the idea from Anger and perfected it. Even though the bodies measure only six to nine inches, depending on the species, one must be impressed by the fine rasp marks, the skillfully blended painting and the meticulous attention to detail, such as the curl on the mallard drake’s tail, the hallmark of his Pringle legacy. 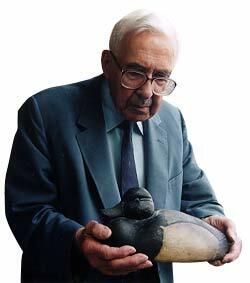 Amazingly, Merle has carved over 33 different pairs of species in this format, recently adding a scoter to the collection. They are cherished by their owners throughout the world. Generally signed, they include the species, gender and year. A generous, kind-hearted, unassuming man, who constantly downplays the value of his work, Merle still sees "a lot of room for improvement" at age 85. Both Harry Freestone and Merle Franklin recall with fondness and some sadness their association with Peter M. Pringle as a much cherished and richly rewarding experience. When speaking with either of these former students, one quickly senses the bond of respect and affection that developed between the then younger men, and as Franklin describes him, "a little, lonely old man, almost stone deaf, who walked with a limp."